You found your dream home, the seller accepted your offer, you’ve set the closing date – only to receive bad news from the home inspector that there’s mold. Now what do you do? 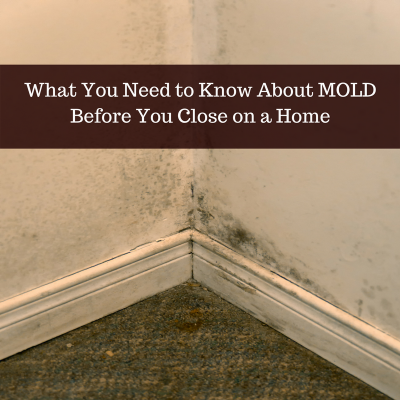 The most important thing to understand is that although mold is naturally occurring in nature, high concentration in the home can cause problems. Mildew and mold are caused by moisture from anything like a leaky pipe to improper ventilation. Whatever the cause, it is a potentially serious issue that you will want to further investigate. Don’t assume it’s just a cosmetic problem that you will be able to remedy with soap, hot water and a little elbow grease. If you, or a home inspector, find mold or mildew in a home you’re considering to purchase, you will want to call in certified mold remediation specialists to evaluate the extent of the problem. In addition they’ll be able to provide a quote for the remedy. Both mold and mildew are a type of fungi and spread by spores. Mold can spread undetected behind drywall, moldings, and fixtures and is not always visible. Furthermore, not only can mold damage the structure of a home, it can also cause serious health problems for residents such as asthma and other respiratory problems. If, on closer inspection, the certified mold remediation experts find that it is a surface only problem and easily remedied you will have peace of mind knowing it can addressed easily. However, what if you find out there is wide-spread mold throughout the structure? Don’t you want to know that before moving your family into the potentially toxic environment? For more information, here are 10 things the United States Environmental Agency (EPA) thinks you should know about mold. Neither mold nor mildew should be dismissed when considering a home purchase as it can be an ongoing problem if not properly remedied. In one of your largest investments you’re likely to ever make, make sure you take the time to call in certified mold specialists.